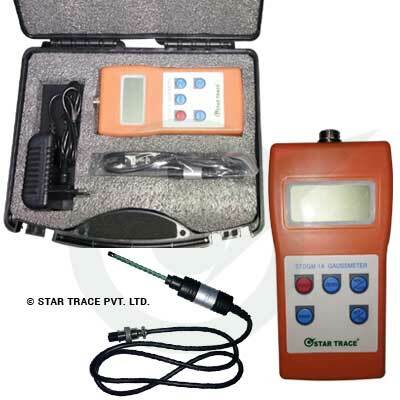 Star Trace, a quality driven company has been manufacturing and supplying top-class Digital Gauss Meter, which gives outstanding performance. Our range of Digital Gauss Meter is manufactured from the highest quality raw materials to ensure better quality of products and customers satisfaction. Digital Gauss Meter Model S – 20 B is a low cost Digital Gauss Meter Hand Held type Instrument for measuring D. C. magnetic fields using Hall Probes. Digital Gauss Meter has two ranges 20 K Gauss. It has developed and manufactured in calibration facility ensures quick check of calibration. Battery operated Digital Gauss Meter, A.C. field Digital Gauss Meter, Low field Digital Gauss Meter. Special Digital Gauss Meter can be made on request, Please send us their technical data and application, required for our engineers to provide.